It was the end of the team-building training, and as everyone politely applauded, Maria began gathering her things. The binder. The picture of her with Diane holding the eight-foot paper elephant. Her certificate. And of course her notes, which included long lists of to-dos that came to her during the times she was zoned out. Feeling both energized and depressed, she turned to her left to look at Diane. 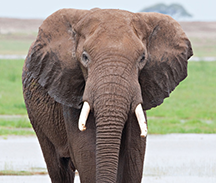 An elephant bull, head-on. Photo by Joe Milmoe, courtesy U.S. Fish and Wildlife Service. Diane looked back, saying nothing. They were both tired. Finally Diane said, very quietly, "Two days. What a waste." Maria nodded and they both stood and walked silently out of the room, among the first to leave. Back in Diane's office, door closed, Maria kicked it off with, "And how long will it be till we forget this?" Maria's impish side triumphed: "Forget what?" They both laughed. A needed laugh. "You know what I mean," Diane said. "Will we ever use this stuff?" Maria and Diane are experiencing some of the letdown that frequently follows team-building training. It's a common reaction, but it needn't be. Here are some simple ways to make team learning last longer. It's amazing how powerful the words are. Learning is the real goal, so let's call it learning. Training is for puppies. Give the team a choice. Allow budget and schedule for team learning, if they want it. Mandating it instead of supporting it produces different and inferior results. Unless air travel is involved, even two days of education is usually too long. Leaving space between "modules" gives people time to practice and integrate new ideas into their work. Changing the composition of a team is disruptive. The new people often didn't attend the recent team learning experience, and more important, change entails Chaos (see "Now We're in Chaos," Point Lookout for September 19, 2001). You might get more out of a team by keeping its members in place than you would by cycling in an expert for a short-term specialized task. After a team goes through a team learning experience, we hope they'll apply what they've learned. They'll be a bit clumsy at first — it's like learning to walk. Give them the slack they need to experiment with the new methods they've learned. Most important, follow up. Setting an actual date for a "post-graduate" follow-up to any educational experience makes actual application of the learning much more likely. Setting a date creates an expectation that we'll be reviewing the results of applying the methods we've learned. Would you like to see your comments posted here? rbrenpdiLqnlWbbKWaYnuner@ChacfOvnziLuERfOnUPLoCanyon.comSend me your comments by email, or by Web form. I offer email and telephone coaching at both corporate and individual rates. Contact Rick for details at rbrenTopvFaLgHMfXGvQIner@ChacphPwLzIPbiTpDtJPoCanyon.com or (650) 787-6475, or toll-free in the continental US at (866) 378-5470.